This is a very physical, lively play written by Angela Gant in the early 2000s while she was in college; in fact, it won national playwriting awards at the Kennedy Center American College Theatre Festival, the Paula Vogel Award. It speaks to serious subjects, but with an almost effervescent style. Social Darwinism is a facile, slightly confused philosophy about “survival of the fittest” (coined by Herbert Spenser after reading “Origin of the Species” and misunderstood). Since no one has a very good idea of exactly what it encompasses, it is a convenient peg to hang the structure of this play on. Gant has redacted the concept to a frequently witty, unevenly written, and somewhat dated exploration of survival of the fittest in patriarchies.
. . . a very physical, lively play . . . genuinely funny . . . It starts with a group of chimpanzees who are being observed by a male “Field Scientist” (an appropriately pompous and ‘mansplainer extraordinaire Christopher “Fez” Martin) and his nearly silent, browbeaten assistant, Jane (Hayden Lipczenko). The roles of each of these chimpanzees in this original group (alpha male, second banana [i.e., subordinate male], adolescent male, alpha female, subordinate female, adolescent female, outside male and outside female) play out through the other vignettes. Through the vignettes, we get a lesson in patriarchy and its posturing, constant score-keeping, denigration of anything not male, and zero-sum philosophy. The work starts with the chimpanzees (and this section could be cut as it starts to feel redundant), moves onto a backwoods clan, steps into a weird hybrid of maybe around 2000 mixed with the 1950s, and finishes in today’s world. The hybrid world is probably the funniest, particularly as the Alpha Female/Elizabeth (Sofia Ohanian, who has some wonderful comedic timing), seems to be inhabiting both worlds at the same time; there are moments when she seems to be shorting out, ala “The Stepford Wives” (obviously an inspiration as it is casually mentioned by the Subordinate Female/Kate (a suitably feisty and headstrong Megan Hook). The Second Banana/Charlie, as played by William E. Paxton, is a study in how to challenge an alpha by going right up to the edge and then stepping smartly back (at least, once they’ve evolved past Chimpanzee World). 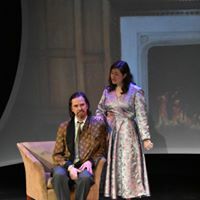 The rest of the cast includes William E. Paxton as the Adolescent Male/Isaac; Kathleen G. Harding as the Adolescent Female/Jessie; Levi Mboni as the Outside Male/Austin; and Rumbidzaishe Bvudzijena as the Outside Female/Mary. They are uniformly attuned to their characters and help fill in the familial gaps. David Crandall did an excellent job with the sound design; one of the funniest moments occurred during a courtroom scene toward the end when suddenly, starting quietly, came the familiar opening bars of “Law & Order.” And the movement coach did an excellent job, particularly with the transformation of the cast into chimpanzees for an extended period; he made it look effortless. Overall, this is an earnest, heartfelt work that is outraged at the cost of the patriarchy to all the groups that make up society—from the original family grouping to the broader nation-states. It didn’t have a lot of new ground to cover, and at times, the disposition by the Field Scientist felt like attending a lecture, but it moved nicely along, had some genuinely funny moments, and the cast was very good. It was a fun afternoon. Advisory: Strong language, some sexual posturing, toy guns. Running Time: 2 hours with a 10 minute intermission. “Social Darwinism” is playing at the cultural arts center at the Montgomery College’s Takoma Park/Silver Spring campus, from April 5 to April 14, 2019. For more information, please click here.